Cheat codes for GTA 5 on PC: make your characters invincible, get infinite ammo, spawn vehicles and more. If you're looking for cheats in the PC version of GTA 5, we'll talk you through all the cheats available below. You'll find GTA 5 cheat codes for everything from invincibility to exploding bullets. Just whack the tilde key (~), or whatever key is next to the 1 key on the top left of your keyboard, and enter the cheat codes below. We've tested all of these GTA 5 cheats to make sure they work first. It's worth saying you have to enter them in all caps. 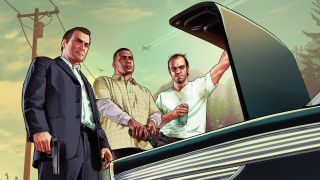 Naturally, these cheats won't do you any good for the multiplayer component of GTA 5, but if you're wondering how to spin cash in the game's multiplayer component, we have an extremely detailed moneymaking guide for GTA Online. You can also find the fastest cars in GTA Online here. We'll also explore the fabled existence of a 'GTA 5 money cheat' below—but be prepared for bad news. As much as you might want it, GTA 5 sadly has no money cheat for instant cash, and never has. You'll have to earn cash from doing in-game activities instead, like playing the stock market, or from businesses or side missions on the map. PAINKILLER Invincibility for five minutes. FUGITIVE This will increase your wanted level by one star each time you enter it. LAWYERUP This will have the opposite effect, dropping your wanted level by one star. TURTLE Instantly give yourself maximum health and armour. TOOLUP This will fill your inventory up with one of every type of weapon and plenty of ammo. HOPTOIT Gives you a super powerful jump that's a lot of fun, and you don't take damage when you land. CATCHME Makes you run a lot faster. MAKEITRAIN Cycles between weather states. POWERUP Recharges the special ability meter of each singleplayer character. SKYDIVE Gives you a parachute. HOTHANDS Gives you explosive melee attacks. Is silly and fun. HIGHEX Makes your bullets explosive. LIQUOR Switches on drunk mode, in case you needed that. DEADEYE Enables slowmotion aiming, and stacks up to three times. SKYFALL Spawns you in the sky. FLOATER Enables moon gravity, but it doesn't have a massive effect, really. SNOWDAY Makes your car a bit slide-y. SLOWMO Makes the world slow, and can be entered several times for maximum slow motion. FLYSPRAY Spawns a duster aircraft. RAPIDGT Gets you a fast car. BUZZOFF Spawns a Buzzard helicopter. OFFROAD Gets you the Sanchez bike. HOLEIN1 Gets you a little golf car. BARNSTORM Spawns a stunt plane.